King Bhumibol Adulyadej proposes a philosophy of “sufficiency economy”; this principle underpins the sustainability market in Thailand. A market that has seen rapid transformation in the last five years. And since Atelier Ten opened an office in Bangkok in 2012, we have been adding our unique brand of creative engineering to the mix. We are closely collaborating with the Thai Green Building Institute on developing a shell and core version of the Thai’s Rating of Energy and Environmental Sustainability (TREES). TREES is a sustainability benchmarking system, launched for new construction buildings in 2009, created specifically for the Thai design and construction industries. Demand within Thailand’s new commercial developments for high performance and exemplar sustainability credentials has created a need for a shell and core version of TREES, which will launch in mid-2015. I am serving as a member of the TREES shell and core committee which is charged with writing this new version. As a committee member, I bring Atelier Ten’s considerable experience of sustainable benchmarking and my own experience and knowledge of the Thai construction industry to the discussions. I have contributed to the requirements for energy and atmosphere, indoor environmental air quality, as well as to the creation of a new pre-certification stage. Pre-certification will require owners to declare performance targets for projects, which will be reviewed on site by a TREES Associate or Fellow, both during and after construction. This will help reduce the energy gap, and provide assurance to occupiers that aspirations for sustainability have been met. Incentives have been implemented by the Bangkok Metropolitan Authority to encourage developers to target TREES certification; increases in the allowed ratio of total floor area to land area are available for projects that achieve TREES certification. In addition, key Thai government projects are now required to achieve a TREES rating of at least a Silver Level. Our contributions to TREES are complemented by our prestigious and award-winning project work, which puts into practice the principles we are incorporating into the new version of TREES. We’ve recently been involved in the Magnolias Ratchadamri Boulevard, the ICONSIAM waterfront development on the Chai Phraya River, and the Sindhorn Langsuan Complex in downtown Bangkok, part of Crown Property. 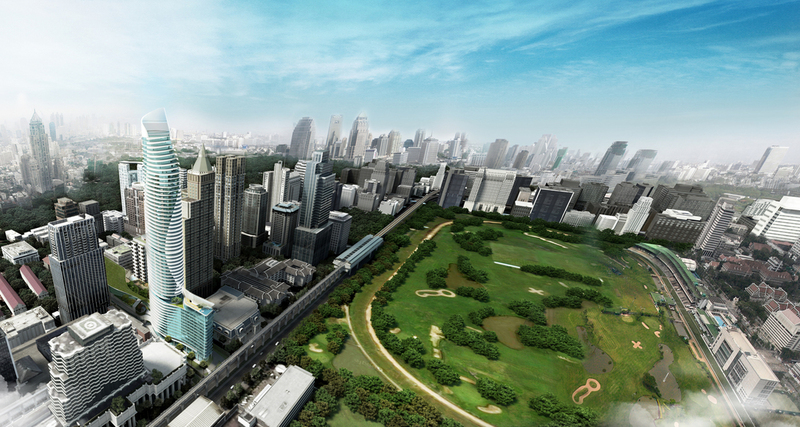 In 2014, the Magnolias Ratchadamri Boulevard won the Best Residential Architectural Design at both the Thailand Property Awards and at the Southeast Asia Property Awards. We worked closely with the design team to develop a high-performance external shading system, resembling twisted petals, along with a high efficiency building system to create a comfortable indoor environment for the residents. Naturally, given our wealth of experience, the project was designed and constructed to meet both local rigorous environmental standards, and we have targeted certification with LEED new construction. With offices in Bangkok and Singapore, we are well positioned to capitalise on the newly created ASEAN Economic Community, which will open up free trade between 10 countries in Southeast Asia and bring us exciting new opportunities across the region. With this and the growing demand for sustainable developments in both public and private sectors here in Thailand, as well as the increase in the development of stringent building codes, we are very much looking forward to continuing to shape a more sustainable Southeast Asia.